XANAX tablets are contraindicated in patients with known sensitivity to alprazolam or other benzodiazepines. XANAX is contraindicated with ketoconazole and itraconazole, since these medications significantly impair the oxidative metabolism mediated by cytochrome P450 3A (CYP3A). Certain adverse clinical events, some life-threatening, are a direct consequence of physical dependence of XANAX. These include a spectrum of withdrawal symptoms; the most important is seizure. Whether XANAX is taken for a short or long period of time patients should be tapered gradually to zero dose instead of abrupt discontinuation. Withdrawal reactions may occur when dosage reduction occurs for any reason. Withdrawal seizures have been reported in association with the discontinuation of XANAX. Abrupt discontinuation of treatment should be avoided. Patients should not operate machinery or drive motor vehicles while taking XANAX. Caution patients on the use of alcohol and other CNS depressant drugs during treatment with XANAX. Benzodiazepines can potentially cause fetal harm when administered to pregnant women. XANAX is assumed to be capable of causing an increased risk of congenital abnormalities when administered to pregnant women during the first trimester and administration should be avoided. XANAX should be prescribed with caution to women of childbearing potential. Benzodiazepines are known to be excreted in human milk, and it should be assumed that alprazolam is, as well. As a general rule, nursing should not be undertaken by mothers who must use XANAX. XANAX should be avoided in patients receiving very potent inhibitors of CYP3A (azole antifungal agents- ketoconazole and itraconazole, as well as nefazodone, fluvoxamine, and erythromycin). XANAX dose reductions are recommended during coadministration with nefazodone, fluvoxamine, cimetidine, and HIV protease inhibitors. Hypomania and mania have been reported in association with the use of XANAX in patients with depression. XANAX should be limited to the smallest effective dose to preclude the development of ataxia or over-sedation, which may be a problem in elderly or debilitated patients. The usual precautions in treating patients with impaired renal, hepatic or pulmonary function should be observed. The most commonly observed adverse reactions in patients taking XANAX vs placebo for anxiety disorders in clinical studies (incidence ≥5% and twice the rate of placebo) were drowsiness, light-headedness and dry mouth). The most commonly observed adverse reactions in patients taking XANAX vs placebo for panic disorder in clinical studies (incidence ≥5% and twice the rate of placebo) were impaired coordination (40.1% vs 17.9%), dysarthria (23.3% vs 6.3%) and sexual dysfunction (7.4% vs 3.7). XANAX (alprazolam) tablets are indicated for the management of generalized anxiety disorder, or the short-term relief of symptoms of anxiety in adults, including anxiety associated with depression, and Panic Disorder in adults, with or without agoraphobia. 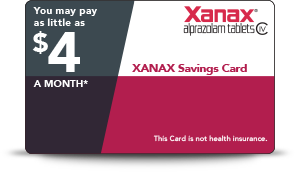 You will pay $4 for a 30-day supply (30 tablets) if: Your out-of-pocket expense for a 30-day supply of brand-name XANAX is $129 or less. Patients can receive a maximum savings of $1500 per year. This offer is not valid for prescriptions that are eligible to be reimbursed, in whole or in part, by Medicaid, Medicare or other federal or state healthcare programs (including any state prescription drug assistance programs and the Government Health Insurance Plan available in Puerto Rico [formerly known as “La Reforma de Salud”]). This Card cannot be combined with any other rebate/coupon, free trial, discount, prescription savings card, or similar offer for the specified prescription. Offer valid only in the U.S. and Puerto Rico, but not for Massachusetts residents or where otherwise prohibited by law. This Card is limited to 1 use per person per month during this offering period and is not transferable. It is illegal to sell, purchase, trade, or counterfeit, or offer to sell, purchase, trade, or counterfeit this Card. Pfizer reserves the right to rescind, revoke, or amend the Card Program without notice at any time. Card Program membership expires December 31, 2018. For questions about this Card, please call 1-855-854-4535, visit Xanax.com, or write to the address below. Encourage Your Patients to Sign Up Today. See How.